Hello there friends and followers and all you great people! It's been a while since I posted. Not because my blog has been out of mind but for the same reasons I've stated before only even more so. Very busy with my school and just trying to deal with all the incoming stuff every day. At times it's relentless. Doing my best to balance it all out. Unfortunately it comes at the expense of my personal creativity. But I have been doing some things and will follow up in the near future with what I've been up to. Around midnight I went to the rooftop again to see how bad it was. 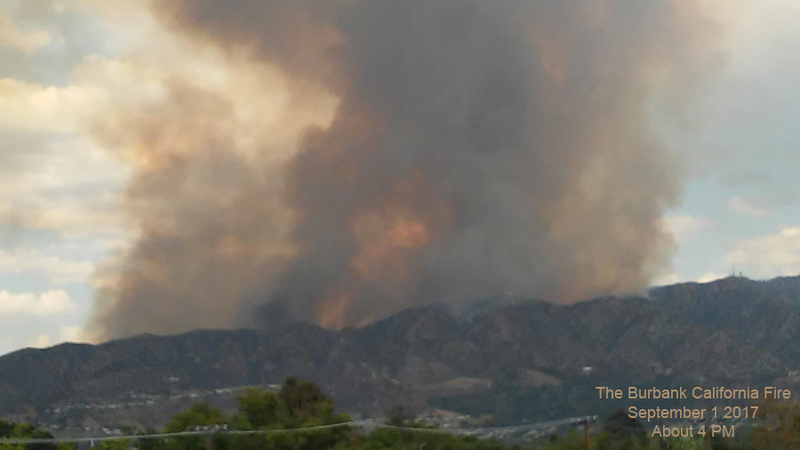 The fire became very widespread. Way beyond what you're seeing here. 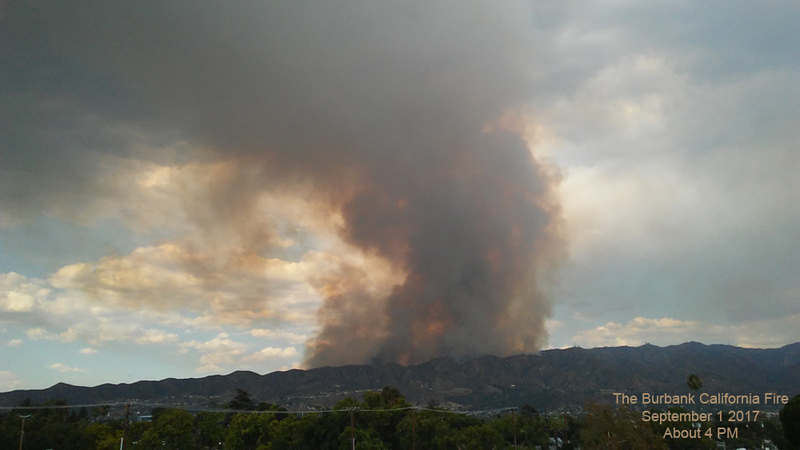 This was the area that was directly threatening Burbank. At this point is was bearing down on the hillside homes. Sorry about the poor image quality of the picture below. 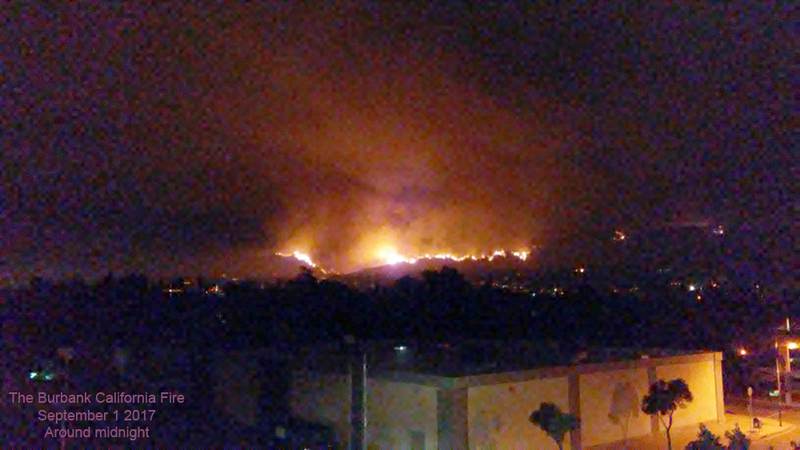 My phone camera wasn't made for zooming in on wildfires at night. At this point the fire line was approaching houses. I thought there was no chance of saving them. The spots of lights you see at the bottom right and along the lower parts of the picture are neighborhoods. Check out this amazing and dramatic photo. I don't know who took it. A friend sent it to me that night. They got it from someone else. 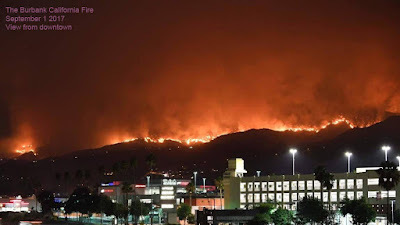 This is downtown Burbank California in the area of Cartoon Network. As it turned out the firefighters did an outstanding job. 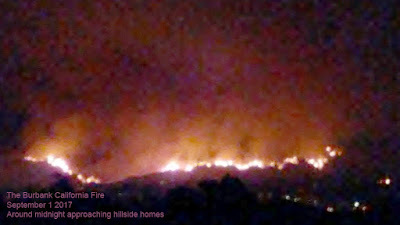 Helicopters dumping water and flame retardant all weekend saved just about all the homes and property and there was no loss of life. A big thanks also to Providence for keeping the winds low and for the rain that fell in our area on Sunday Sept 3 which helped to kill the blaze. In all my years living in this area I can't remember a time when we got rain in early September. But we did! Miracles never cease. Burbank is a very special place and God protects this wonderful city. At least that's how I feel about. 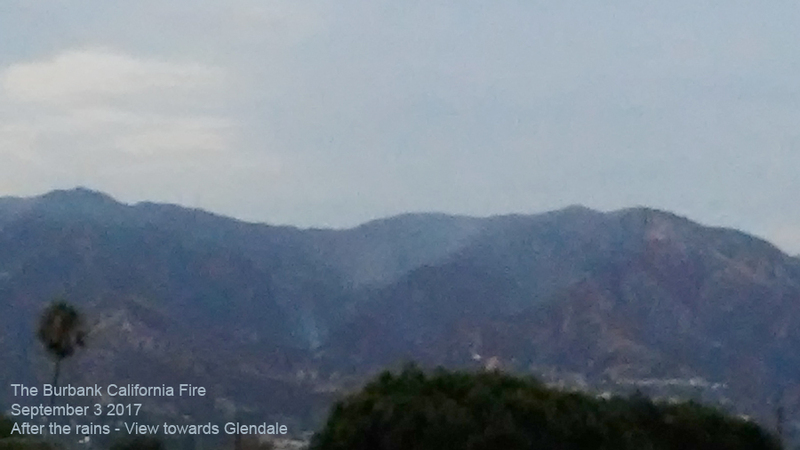 Anyway here's what the smoldering fires looked like late Sunday afternoon Sept 3 around 48 hours after they started. I shot some video too which I'll add to this post later on. Even when disaster strikes remember that life is good and precious and it's beautiful. Count our blessings every day. Peace love and happiness to you! Hey Charles I heard a about the fire not to long ago looked pretty intense. But I'm glad your that your safe and and nobody in the area were harmed. Oh wow, that was a big fire, glad to know that everything is alright now and I hope no one was harmed. In any case I'm happy to hear that the school is going great, and I'll be waiting patiently for more of your art. Hey Charles, it's me, BandicootLatte! (Or Latte, ha) I got a new email and stuff so if my username is different, then you know why! Gosh, that fire is crazy! It must have spread quickly, good thing the firefighters put it out! I hope everyone do there is okay! Those are some stunning photos though! Thanks for your comments Hazman and Gabriele. Latte I've seen the cover for the upcoming book and I'm pleasantly surprised that the sketches of Crash are drawings I did when we were developing the character way back in 1995. I think I mentioned it before that if I knew they'd be featured on a book cover 22 or 23 years later I would've done a better job! Anyway I'm happy about it. Dark Horse Comics posted it on Facebook the other day and it's getting some attention. We'll see how it turns out. ArtShark sez have a "Happy Autumn!"